The main park area was opened in 1995. The Fieldhouse was added in 2008, and the Town Square in 2014. The final phase, the Community Centre, will take place over 2017-2023. Sorauren itself is named after the Battle of Sorauren in the Roncesvalles Pass in the Pyrenees Mountains in Spain, near the city of Pamplona. Col. Walter O’Hara, who settled in this part of Toronto and named the local streets, fought in that battle in 1813 during the Napoleonic Wars. 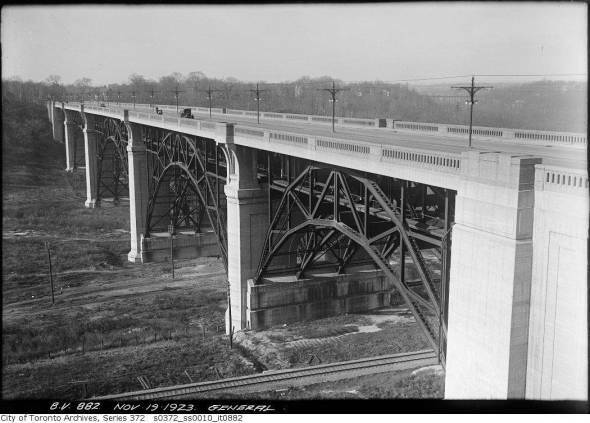 The Sorauren-made girders in place. Still holding up the bridge today! The park site encompasses two old properties. 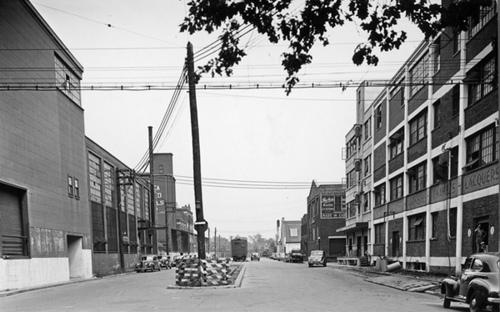 The main property on Sorauren Avenue was first a plant for the Dominion Bridge Steel company. 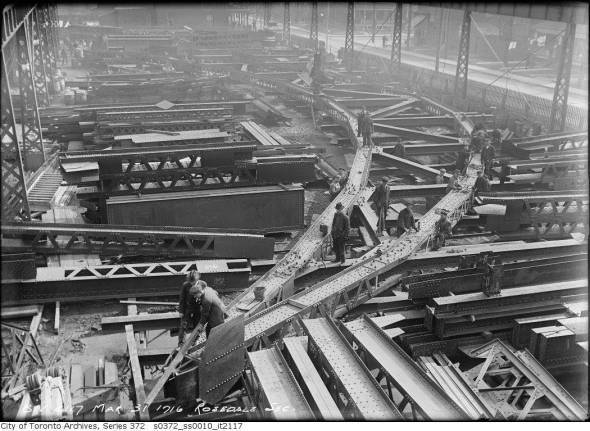 Among its projects was making the steel girders for the Bloor Street Viaduct around the time of the First World War. See more pictures at Lost Toronto (thanks to Greg Chown). 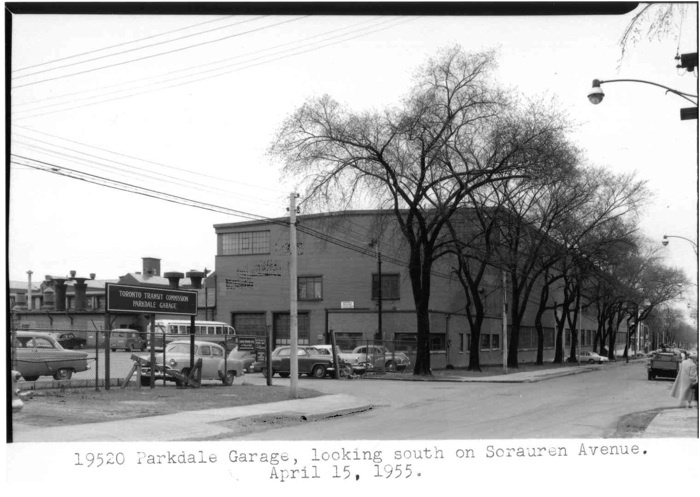 Between the world wars, the TTC took over the site to create the Parkdale bus garage until the 1980s. Decommissioned, it was briefly a film studio; a made-for-TV sci-fi series called Captain Power and the Soldiers of the Future was made there. When the site was slated to become a garage for municipal garbage trucks, the community had other ideas, and the battle was on to establish a much-needed neighbourhood park. After countless volunteer hours and actions, Sorauren Avenue Park was officially opened on September 17, 1995. Barbara Hall was mayor at the time, and see her and others recall the opening of the park in this video prepared by the Roncesvalles Macdonell Residents’ Association. Landscaping was built up over the old concrete pad of the transit garage, a cheaper alternative to removing the concrete. Drainage over much of the park suffers because of this, with trees and grass having a hard time growing except around the margins of the park where there is no underlying concrete. The community celebrated the park’s 20th anniversary in 2015. All during this time, the vision for the precinct extended to building a new community centre near the park, on the former property of the Canada Linseed Oil Mills Ltd. More history and photos on the proposed Wabash Community Centre can be found here. Also read the fascinating history of the linseed mill by historian David Wencer on spacing.ca here. Illustration showing the linseed (flax) mill on Wabash Avenue. The tall flax seed elevators are gone. The mill and chimney still stand, abandoned. Rail spurs come up Wabash Avenue. 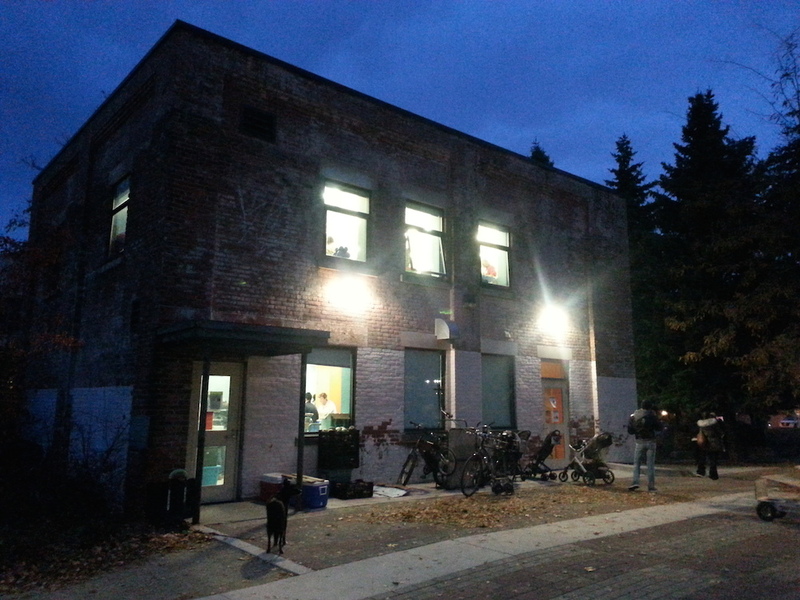 With an eye to building the community centre, the City bought the derelict linseed mill property on the north side of Wabash Avenue, adjacent to the park, in 2000 for approximately $2 million. (Chris Korwin-Kuczynski was councillor at the time.) The property contains the 40,000 sq. ft. former plant of the Canada Linseed Oil Mills, built in 1915 of solid concrete, but abandoned since about 1970. The plant processed flax seed, also called linseed, for decades. Looking down Wabash Avenue from Sorauren Avenue, 1947. The building on the left shows where Sorauren Park now exists. The building on the right is now Charles G. Williams Parkette. The building on the right with the peaked roof is now Addison’s Plumbing. Rail spurs from the Grand Trunk rail line (now the Metrolinx Kitchener-Georgetown line) went into the plant and up the centre of Wabash Avenue to serve industry. In 2003, a City-commissioned feasibility study showed the old flax mill building could be converted into a community centre, an idea supported by residents through several surveys and community meetings. There is also a smaller 2,000 sq. ft. building on the site, formerly the administrative offices for the linseed mill, and now converted into the bustling Sorauren Park Fieldhouse. Market Day at the Fieldhouse, Mondays 3 – 7 p.m. The Fieldhouse building has a colourful past. After decommissioning for the linseed operations, for some years it was a noted after-hours speak-easy. If you can contribute to this part of the history, let us know! In 2004, while Sylvia Watson was councillor, the City conducted a major $1-million environmental clean-up of the site, removing contaminated soil and asbestos in the old buildings. 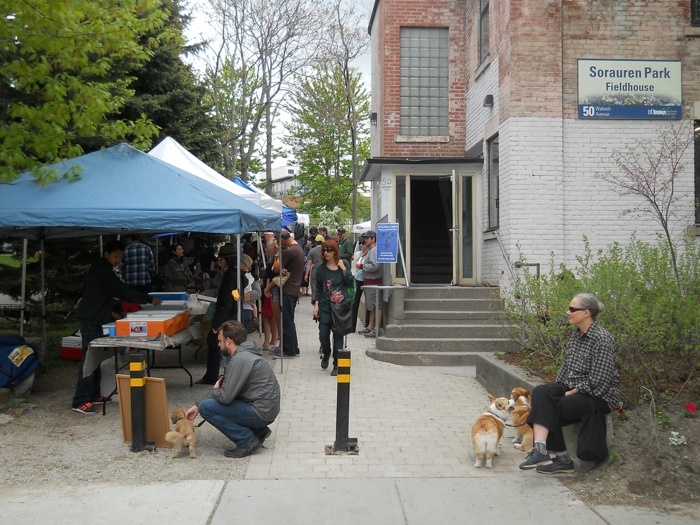 In 2006, a community group borne out of the Roncesvalles-Macdonell Residents’ Association formed to become the Wabash Building Society, a non-profit corporation dedicated to restoring the Wabash property to community use. 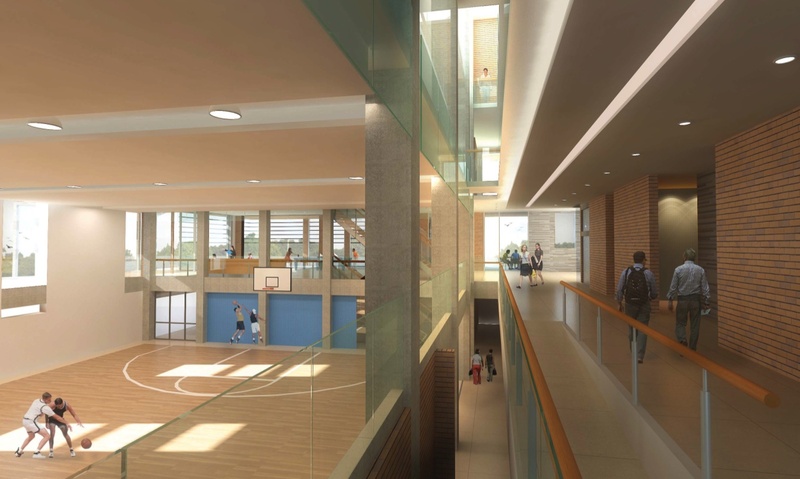 As part of a “baby steps” campaign, the WBS focused on developing the Fieldhouse to quickly provide washrooms, storage space and meeting space for the park. Over the years, the children’s sports league in the park has grown from about 100 kids to more than 750 registered each season… all serviced by two temporary porta-potties. Thanks to the efforts of the community, a fundraising campaign, grants from the Evergreen Foundation, in-kind donations, “Section 37” development fees from nearby condo and loft developments, and City support, Fieldhouse construction began in October 2007. The building opened in May 2008. 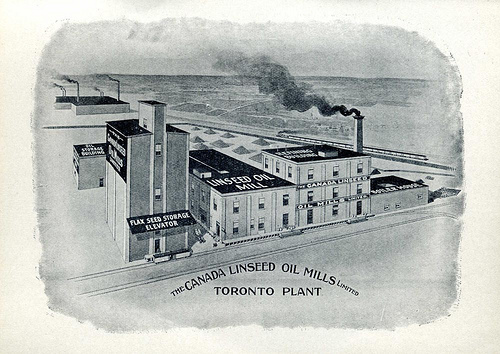 The miraculous flax plant upon which the linseed oil industry was built. 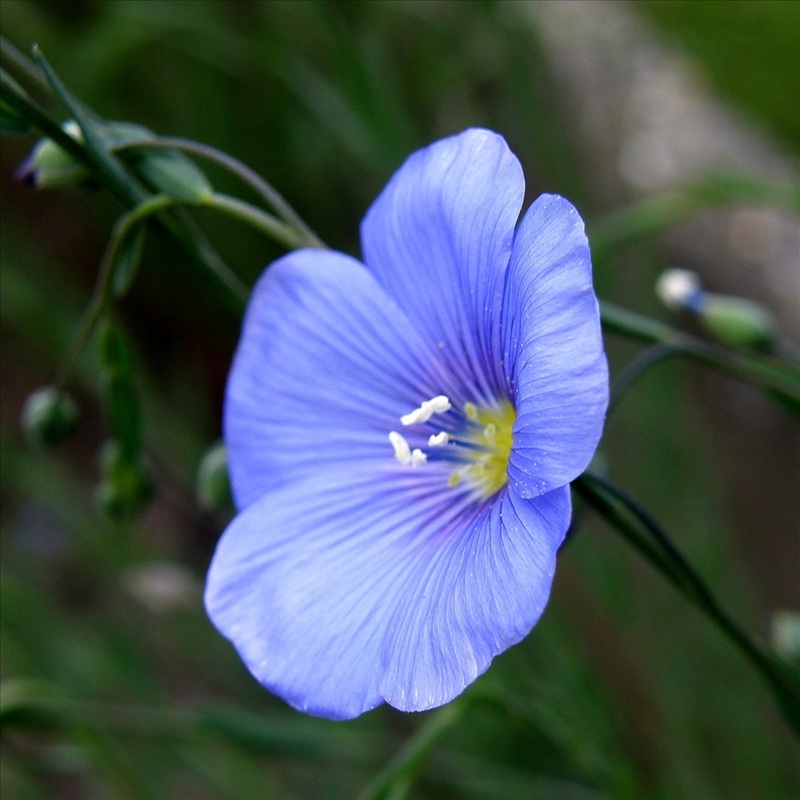 Flax has been cultivated for at least 3,000 years because of its many uses, including human food (high in omega-3), animal feed, oils, textiles (linen) and now biofuel. The WBS then set its sights on the vacant land still fenced off between the Fieldhouse and the old linseed factory. The site once housed the grain elevators for the flax seed, serviced by the rail spur. 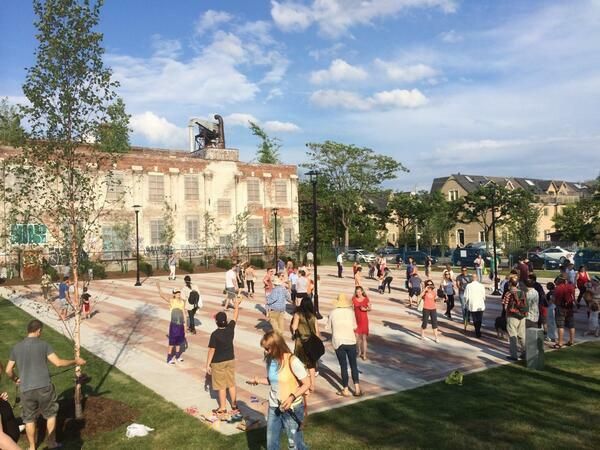 In July 2014, following a community fundraising campaign with support from Live Green, TD Friends of the Environment, Councillor Gord Perks and the City, the new multi-use Sorauren Town Square was opened. It is a new home for the Sorauren Farmers’ Market and other community uses. In 2016, to better reflect its evolving mission, the WBS changed its operating name to Friends of Sorauren Park (the corporate name remains Wabash Building Society). Sorauren Park is our patch of green space and blue sky. Our meeting place. It has a pleasing view of downtown, the CN Tower and St. Helens. It is well used and maybe even loved by thousands of Torontonians from all walks of life and backgrounds. It is home to busy tennis courts. Soccer and baseball teams. Cricket players. Kite flyers. Joggers. Dog walkers. Skaters (when winter accommodates a natural ice rink). The Pumpkin Parade. Christmas carollers. Birthday parties. Picnics. Community events. The Holly Jones memorial garden. The RMRA presidents’ tree. The Fieldhouse and Town Square. The Sorauren Farmers’ Market. The first of many future generations of kids to grow up in the park has now entered adulthood. And there’s still work to be done! 40 Wabash Avenue, the old flax plant, looms over the park, waiting for its transformation (see the plans). City Council voted to approve the Wabash Community Centre in 2017, with a forecast completion date of 2024. 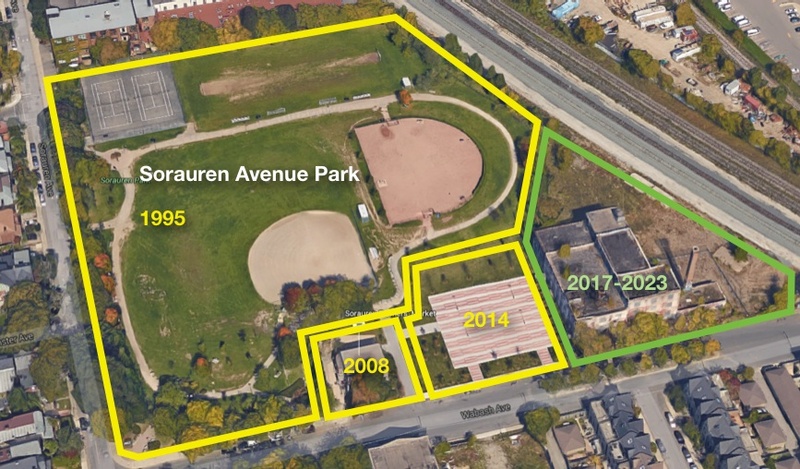 The Friends of Sorauren Park and other groups remain committed to the original mission, and they invite your ideas, donations and participation.